Ho Brah! 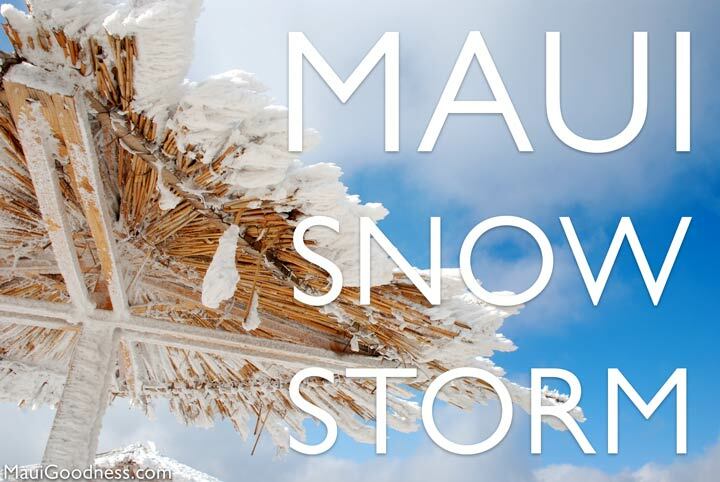 It’s Snowing in Maui, Hawaii! Time to bust out the foot mittens, ’cause today may be the only day in history it’s acceptable to wear socks and slippahs. At 2am this morning, a freak snow storm hit Hawaii, much to the obscenely polite dismay of Maui’s Canadian visitors, many of whom came specifically to escape the similarly frosty conditions back home. 3) lift as the aforementioned moisture rose to become rainbows, made fully of human sweat and tears. Swainbows, if you will. As ice and snow formed on the shores of some of Maui’s most popular beaches, shocked visitors were treated to the freshest Hawaiian shave ice of their lives, albeit slightly sandy and full of rainbow sweat. Local residents Steven Tyler and Willie Nelson were seen building snowmen and snowladies together on the slopes of Haleakala at Oprah’s expansive Upcountry private residence! Upon seeing them in her front yard, Oprah had a classic ‘aha moment’ and called for Mick Fleetwood to retrieve 4 solid gold sleds on his ride up to join them, where they then spent the afternoon sledding into pools of their own frozen cash and joy. Unprepared for sudden freezing temperatures, many local Maui residents and visitors were forced to use their creativity to prepare for the weather conditions, transforming bikini tops into earmuffs, oven mitts into gloves, sarongs into makeshift scarves, and snorkel masks into snow goggles. While rampant cases of ‘da kine’ and ‘chicken skin’ spread like E. coli at a Chipotle, causing concern among visitors without a working knowledge of basic Pidgin, everyone did their best to remain calm and adjust to the strange new scenery in the formerly tropical paradise. Some of Maui’s bravest entrepreneurs were even seen making the most of the snowy conditions (and closure of the Maui County business license office), creating spontaneously unique activities like Snow Angel Beach Tours, Eco-Friendly Snowball Fighting Tournaments, Reef-Safe Sledding, and Stray Cat Surfboard Racing. While we don’t expect the snow to stick around for long, we do expect it to be shared on social media quite a few times before people realize we made it up. Because let’s be honest, who reads anymore, right? Except for you. Hey, you! Thanks for reading, and happy fake snow storm. haha you had me for a minute there! Just got back from Maui. Expecting some snow ( for real) this weekend. Wish I was back in Maui, brah. Got me hook line and sinker! The funny thing is that is actually does snow on the Big Island. This is the best. Aloha friend!! Holy crap, you got me on this one! ?